Finding the best villas in Unawatuna can be tricky. Simply because, there's so many to choose from! So, use this awesome list to make it easier to decide! Without a doubt, Unawatuna was one of my favourite spots on our 4 week backpacking journey around Sri Lanka. It's only a few hour drive from the bustling city of Colombo, but is a world away from the noise and stress of the capital. Instead, you are surrounded by gorgeous ocean views, beachside restaurants and wonderful places to stay. But with so much choice, it can be hard to find the right place to stop and relax during your time in Unawatuna. That's why I’ve put together this ultimate list of the 12 best villas in Unawatuna. That way, you can spend less time researching your stay and more time enjoying yourself, relaxing under the sun or exploring the nearby sights. For all of the villas, I’ve given a link through to Booking.com where you can find out more about them and check availability. We used Booking.com everywhere in Sri Lanka, as they offer the best deals and are very reliable, so I strongly recommend them. 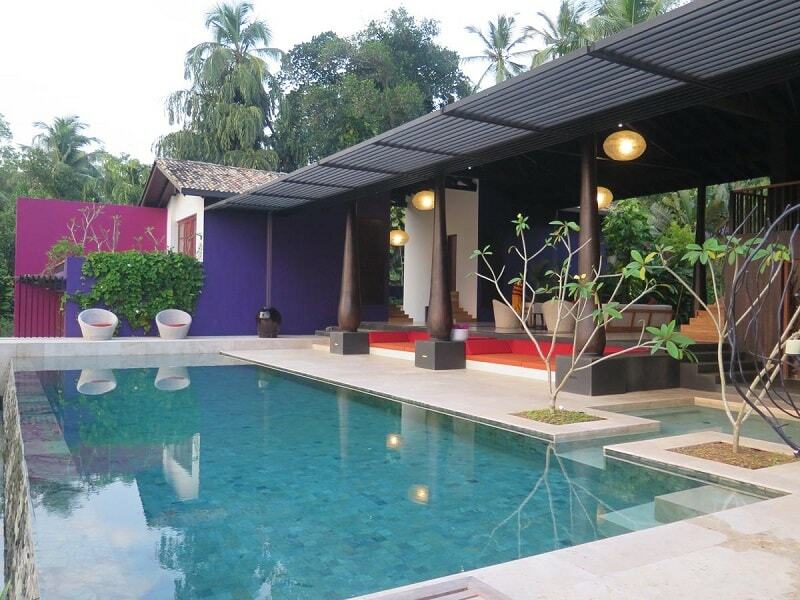 Villa Wambatu is by far the most luxurious villa in Unawatuna. As such, it is quite a bit more pricey, but far and away the most relaxing way to enjoy your time in this breathtaking part of the island. It has enough room for up to 10 guests and features all of the mod cons you’d expect it to have. Such as TVs and DVD players throughout the house. Other key selling points of Villa Wambatu include the swimming pool and hot tub which are free to use for all guests. The whole property has a very Japanese feel to it and is incredibly modern. Each morning, you also wake up to a complimentary breakfast provided by local staff. If you want to head out anywhere, then you’re very close to many of Unawatuna’s main attractions. This includes just a short walk to the beach. 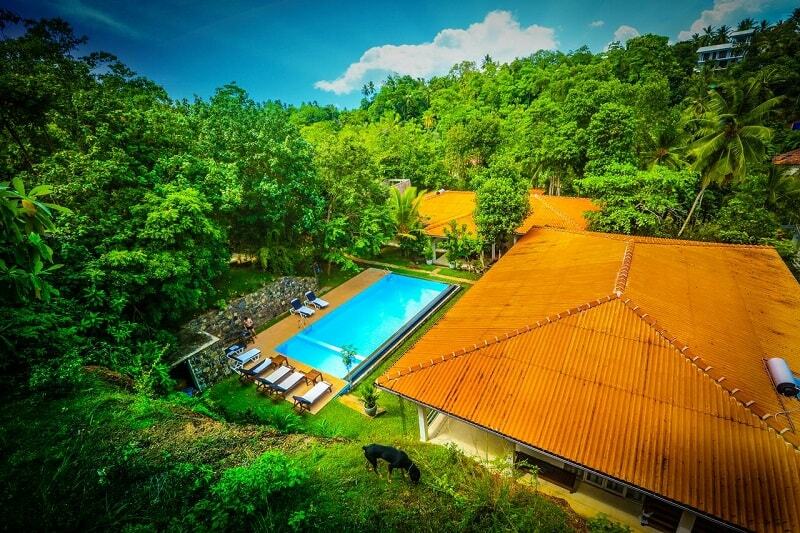 Nature Villa Unawatuna is just a short 2 minute walk from the beach. As such, it is also very close to an abundance of high-quality restaurants for you to dine in at all times of the day. 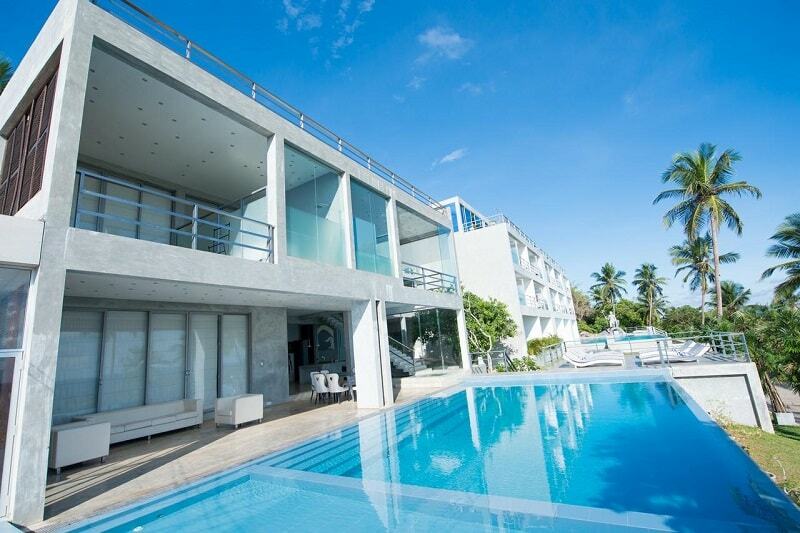 This is one of the largest beach villas in Unawatuna and has enough space for up to 10 people. 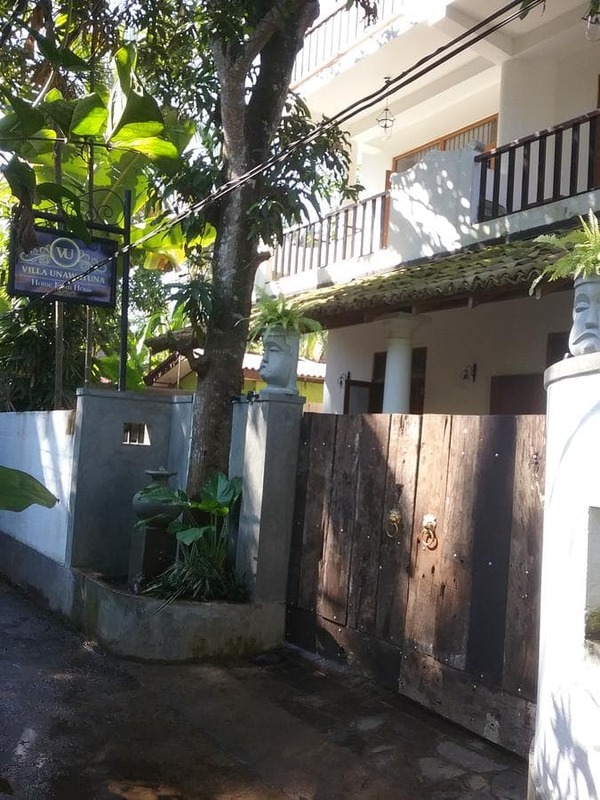 With such a large group, it also works out as one of the most affordable places to stay anywhere in Unawatuna. Which is impressive as it also contains many facilities you’ll struggle to find elsewhere. Such as a large, relaxing swimming pool. Each guest has their own private patio area and every room comes fully air-conditioned. You can choose to include breakfast with your stay, for a small amount extra per person. One of the main reasons Nature Villa is so popular is its wonderful location. Sethum Villa is possibly the best seafront villa in Unawatuna, being just 2 minutes from the main Unawatuna beach and sea. There is room here for up to 10 people, or you can instead choose to book for smaller groups of 8, 6, 4 or 2. It’s close proximity to the beach means you’re always close to restaurants and bars. However, if you fancy staying in on any night, then you can instead dine at the restaurant on site. Or, speak to the owner about using the barbecue facilities they also offer. You can also get a free breakfast every morning, to help make your stay that much more enjoyable. During the daytime, you can chill out on your private patio or relax in the pool. Sergeant House is easily one of the nicest places to stay in unawatuna and has a very exclusive feel to it. 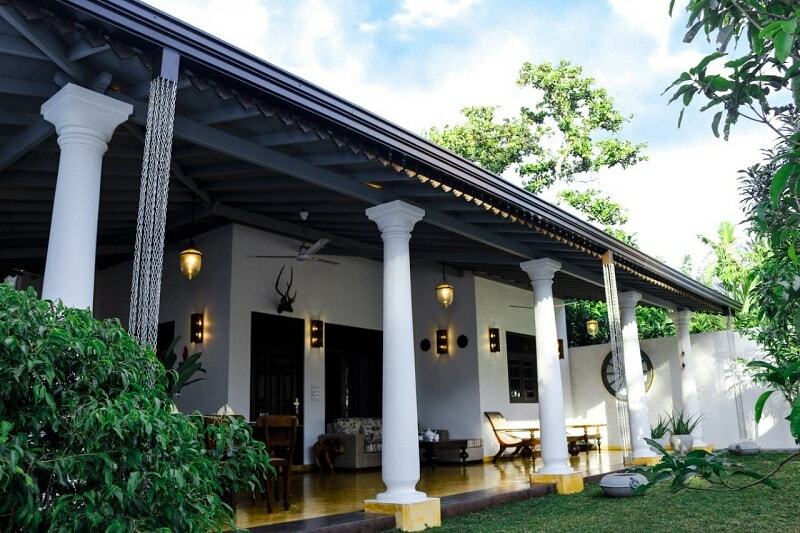 In fact, it is perhaps one of the nicest villas in Sri Lanka overall. You can choose from either a double room, a poolside Pavilion or a personal bungalow that has room for up to 7 people. When full, this bungalow is very reasonably priced, especially for all of the comforts you receive. Though it has recently been refurbished, the architecture of the building dates all the way back to the 1800s! Of course, much of the facilities have been heavily upgraded since then. Such as the spacious outdoor pool and bathtubs found in some rooms. The courtyard of the villa also houses an aquarium as well as a wellness centre. Here you can take your relaxation to a whole other level, through a peaceful massage from a trained masseuse. Guests also love how well located this villa is, and the beach is just a 2 minute walk away. Located on Rumassala Mountain, Villa Thawthisa offers some of the best views anywhere in Unawatuna. The property offers rooms of all sizes, many of which offer spectacular panoramic views out over Unawatuna Beach. If you do fancy heading out, then Unawatuna beach is no more than a 5 minute walk away. As well as numerous bars and restaurants adorning this spectacular part of Sri Lankan coastline. Then again, why would you want to leave! Villa Thawthisa has not one, but 2 infinity pools. As well as a garden area, barbecue and an in-house restaurant. Rooms here are incredibly luxurious, with many containing spa bathtubs. 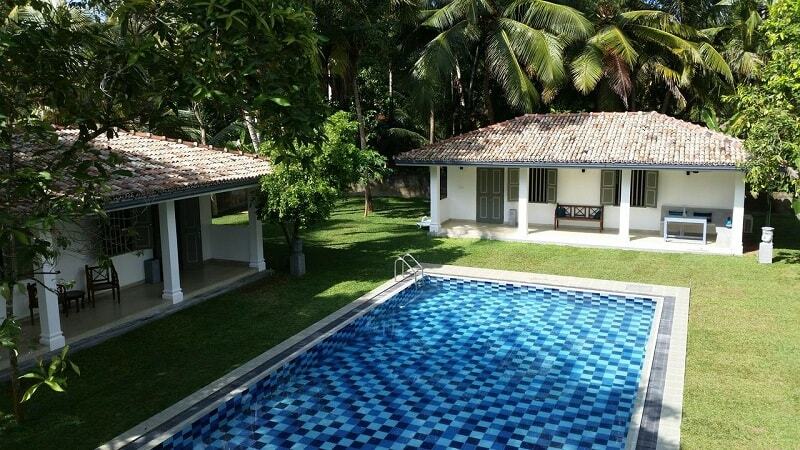 Land’s End Villa is slightly further from the beach than many of these Unawatuna villas in Sri Lanka. However, you can still walk there in a little over 10 minutes. The villa is a short 800 metre walk to the famous Japanese Peace Pagoda. This beautiful building was constructed during the Sri Lankan war as a means to try and bring some peace and calm during this troubled time. Many rooms in Land’s End Villa also contain views out over the sea, and you might even have a bath as well. Perhaps the most appealing reason to stay at Land’s End Villa is the large outdoor pool. The perfect spot to relax and cool off after a long day exploring Unawatuna and Galle. 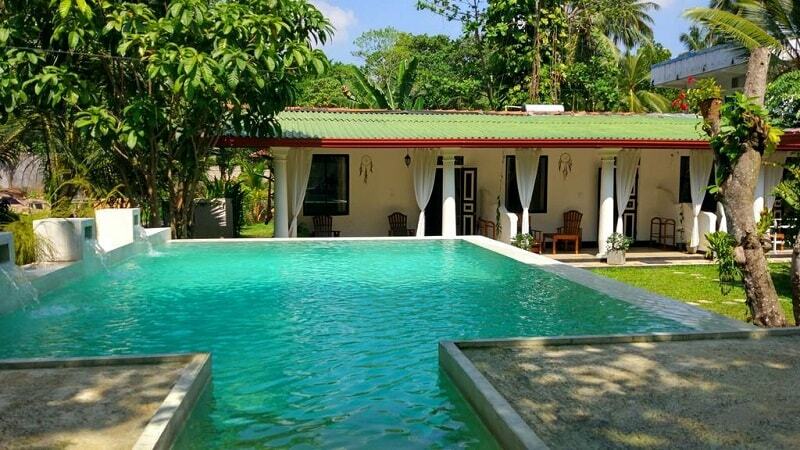 With room for up to 4 people, this 2 bedroom villa is the perfect spot for families or groups of friends looking to relax for a few days in Unawatuna. For around $50 a night per person, you have access to all the facilities you need in order to have a wonderful stay. Including modern stylish rooms with 4 poster beds and a fully fitted kitchen for cooking and dining. You also have a relaxing outdoor patio area and breakfast can be included in your stay if you really want to kick back. When you head out, you can hire bikes or mopeds from the villa owners. And, in the evenings, the beach and restaurants are just a few minutes away. 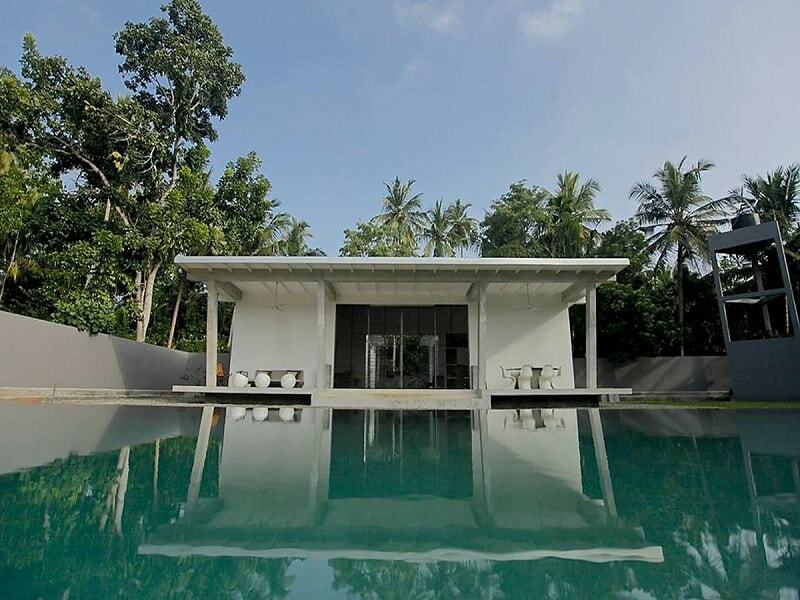 The owners of Pittaniya Villa have clearly put a lot of effort into making their villa feel modern, sleek and stylish. They’ve spared no expense on the finished quality of the rooms and public areas, making this easily one of the best places to stay in Unawatuna. On site, you have a shared pool with other guests, as well as barbecue facilities if you fancy eating in one night. It’s strategically located, not far from many of Gall's most appealing spots. Such as the Galle Fort and Galle Lighthouse. You’re also only a 5 minute walk away from the beach, meaning you have just a short stroll to one of the many restaurants on the the seafront. 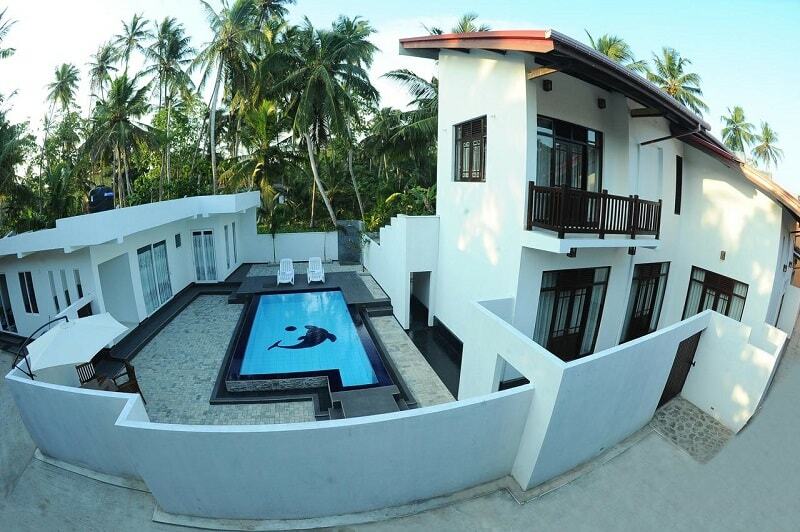 If you are looking for cheap Unawatuna villas to rent, then this should definitely be one of your top choices! Villa Unawatuna costs less than $30 a night for 2 people, and offers many of the same features of the more luxurious villas mentioned above. It is equally well located, being just 6 short minutes from the beach. And also has its own restaurant located on site. All rooms have air conditioning (which I highly recommend getting) and there is also a shared communal area and patio for you to use. 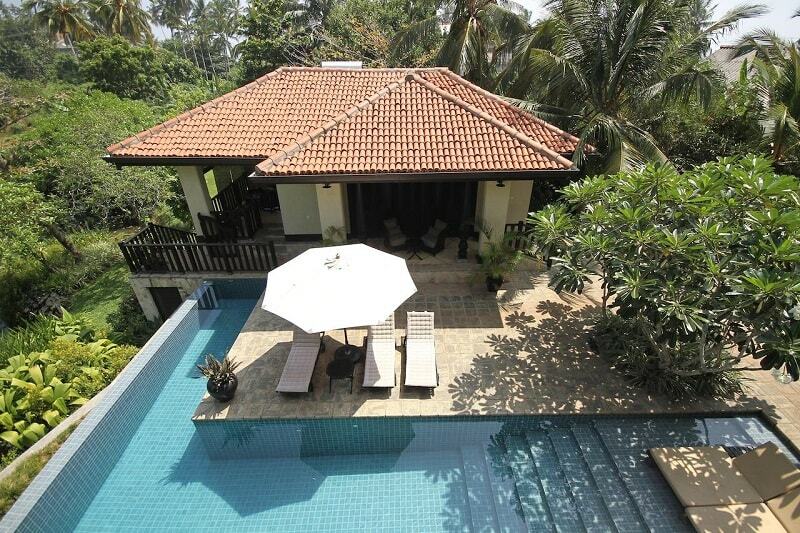 Villa Orenka is another one of the well priced private villas in Unawatuna. It costs roughly the same to stay here, but is located slightly further from the beach. Instead, you are in a lovely area surrounded by lush greenery and still have close access to the local attractions. If you wanted to stay in a villa in order to cook for yourself, then you're in luck. As Villa Orenka has a fully fitted kitchen available for guest use. The staff here are also notoriously friendly and can help with arranging any aspect of your stay in Unawatuna. Beach Grove Villas is actually a 4 star hotel in Unawatuna! So despite being so cheap, you get a really high quality of service for your money. Including access to a wonderfully large communal pool. If you wish, you can enjoy your stay even more by choosing to pay for a massage at the villa. All rooms include air conditioning and free WiFi is available throughout. They also have a 2 bedroom villa that sleeps up to 4 people making this a cheap, but luxurious stay for a small group of friends or a family looking to get away for a while. You’re a short 10 minute walk from Unawatuna Beach and close to many other attractions in the area. 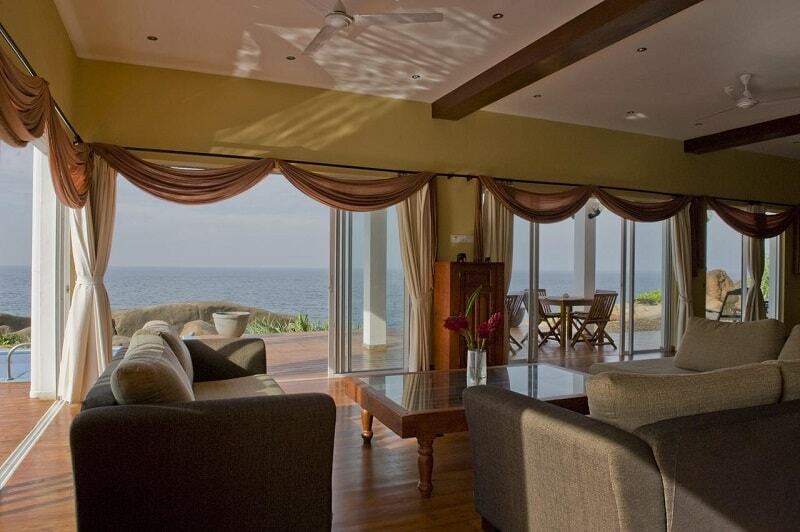 This is one of the nicest Unawatuna bungalows available. And their spacious 1 bedroom villa is perfect for up to 2 people. To start with, you have access to the modern pool available on site. In your villa, you’ll find a bathroom, kitchenette and bedroom. You also have access to a communal lounge area where you can relax and get to know others staying at Thalpe Bungalows. Guests particularly like how wonderfully located this villa is. You’re 9 minutes to the beach and just a few km from everything else. Such as the Japanese Peace Pagoda and Galle. So, what is there to do in Unawatuna? 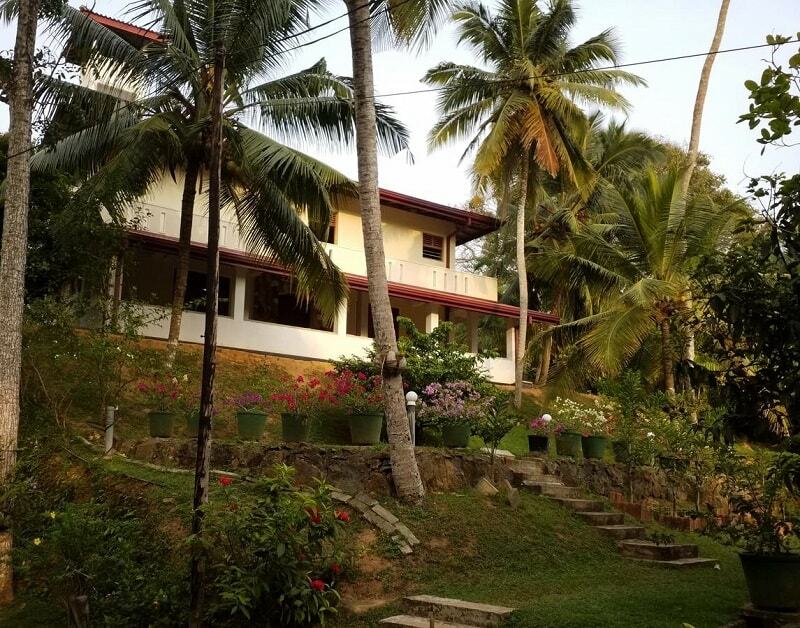 We stayed in Unawatuna for 3 nights in total, and really did love it! It was also our final stop in Sri Lanka, so was a great way to end the trip. Whilst there, we got up to a bunch of different things. For me, much of which was surfing! Number one on my list of things to do in Unawatuna would be to head to the Dog Care Clinic. Sri Lanka has a serious stray dog problem and it was heartbreaking at times to see so many stray puppies already infected with illness at such a young age. The clinic in Unawatuna does so much to help dogs in the area and it is well worth a visit. 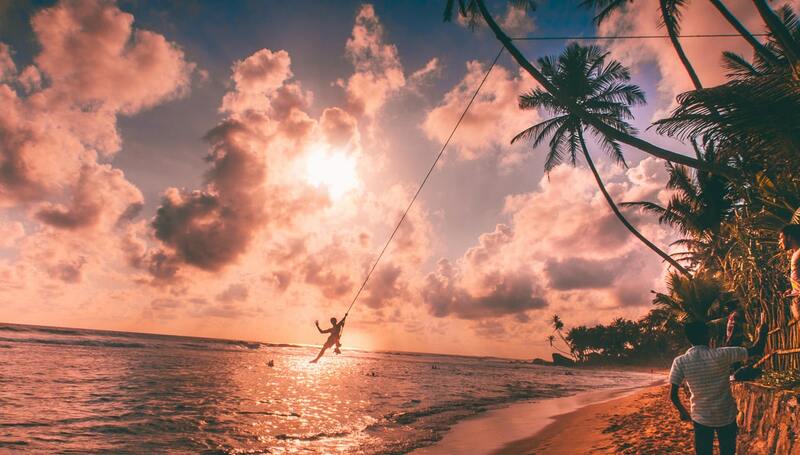 So have a wonderful time in Unawatuna! If you decide to stay in one of the places mentioned above, then drop me a message below. I’d love to hear from you! Want great value tours in Unawatuna?